Do Accident Attorney’s actually help make things safer? In college I had an ethics class taught by an attorney. The discussion centered on lawnmowers. Specifically the safety bar that you had to squeeze in order to get the lawnmower to work. The attorney-professor claimed the Accident Attorney responsible for that safety bar represented a man that was using his lawnmower as a hedge trimmer. Proof you can’t fix stupid as far as I was concerned, but the idea being presented was that it was cheaper for everyone to pay a little more for a lawnmower with a safety bar than it was to pay for the medical bills of people using lawnmowers as hedge trimmers. At the time this was very confusing and obviously I didn’t do well in the class. A couple of weeks ago a phone call came in about a dangerous piece of sidewalk. It was just the kind of call that brought back memories of that ethics class and finally cleared everything up. Nick Mastrangelo was the accident attorney on the line, and he asked a lot of questions. The real reason for the call was that he needed some photos verified showing a badly damaged sidewalk. The date time stamps on the photo needed to be verified using meta data. He couldn’t get new photos because after his call, the sidewalk was fixed. The photos clearly showed that the sidewalk was a mess for months before without any repair work being done. The sidewalk in front of my own house took over five years to get fixed. The call that fixed it? An angry neighbor after her son was hurt skateboarding over the neighborhood “jump” as the kids called it. 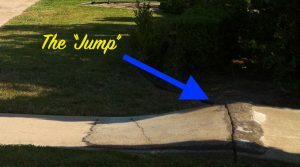 The original repair was just an asphalt patch making the lifted section of sidewalk into the perfect jump. After the sidewalk was fixed, I saw a very confused look asking “why?” on the faces of the boys watching the new concrete go in. It must have been the same look I had in ethics class some years before. Now I get it. So was it the call from the accident attorney that got the sidewalk fixed? I can’t say for sure, but at least this time I wasn’t confused about what the attorney was saying. Next Topic: Gondolas at Disney World?